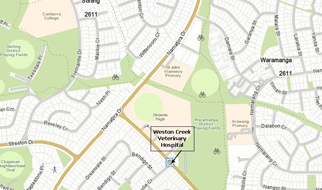 Weston Creek Veterinary Clinic » We will treat our patients with the same care and attention as if they were our own. WCVH has been caring for the pets of Weston Creek and Woden since 1973 and we are one of only four hospitals in Canberra to be accredited by the Australian Small Animal Veterinarians as a Hospital of Excellence. We believe pets are not just animals but members of the family and we care for them as if they were members of our own family. Their humans are important too of course and we pride ourselves on providing excellent customer service. Please take a tour of our practice and meet our team of friendly vets, nurses and receptionist. We hope you enjoy your visit. Looking after your pets in the home. Radiography (X-rays) and ultrasound have the ability to "look through" tissues. Puppy Preschool teaches you how to train your dog so that they are an enjoyable companion. We keep many prescription medications on hand so that treatment can be begun without delay. Our dedicated team of vets and nurses provide the care your pets need. Endoscopy allows us to investigate and treat certain diseases using minimally invasive procedures. A thorough dental examination is essential. Does Fido howl and bark when you leave for work? It is vitally important for your pet's health that they have regular checkups.